Today, Wednesday 25th, is the day of the big British Airways terminal switch at Gatwick. We will have coverage of this tomorrow. Gatwick may now be higher up your radar than it was in 2016. As part of this, I’ll be running a couple of articles about Gatwick this week. First up, I wanted to flag the fact that Gatwick Airport has a freebies and discounts site which few people know about – myGatwick. The site is tailored to your travel plans, allowing you to input details of your forthcoming flights from Gatwick and receive details nearer the time of special tailored deals. …. and some restaurant promotions. You can sign up for myGatwick at their website here. If you do stay at the Bloc hotel, check in to your room before buying anything landside as they have a booklet of offers including 10% off at Marks. I hope they start improving things there. I went through the South Terminal before xmas and the general areas were looking tired. I did see some works in progress but it needs a lot more to make it a prime airport. The No 1 lounge wasn’t bad as an escape but even there they were doing works. My impression is that the recent focus of Gatwick’s improvement works has been at the North Terminal. I like Gatwick but I agree that parts of the South Terminal are looking tired. Security at both terminals still seems pretty good. ….. it still look tired and the shopping mix is pretty awful. My Gatwick offers can also be added to Passbook and they’re often valid for the whole year which makes it worthwhile keeping them there to save having to keep going back to the website for each flight. How do you add to passbook? I ve looked everywhere ! Why no GatwickRewards? I don’t use Heathrow so feel miffed we don’t get the deals that run there. Presumably because Gatwick Airport Ltd have decided against launching such a scheme. 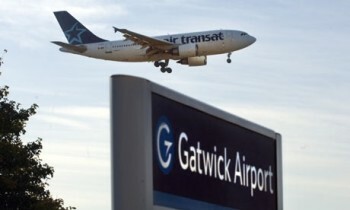 Prior to the enforced sale of Gatwick BAA Worldpoints as it was did cover Gatwick – use to go there regularly for work and pick up points on the short stay parking…. O/T just been reminded of https://secure.tesco.com/clubcard/boost/redspottedhankycom/UK-001916.prd as an alternative to converting Tesco points to Avios, haven’t really remembered this for a couple of years & might help somebody? It’s a real money saving where 250 points = £5 (£1 booking fee), & RSH has identical prices to (say) Trainline – though the ticket split cos can give you a better saving, always worth checking. If you value Avios @ 0.7p, 250 Tesco points = £4.20 – so RSH is a good alternative. For 1p faithful, £6 value in Avios; being Avios rich, whilst I always get a lot more than 1p value @ time of booking (or would pay cash instead), I will deffo bear RSH in mind as my wife is always taking the train to London so this might be a way to cash out on her ex’s. There is never any reason to go to the trainline except if there is an Amex £10 off offer or something. But my recent Amex 2% back offer was worthless. Just a shame that BA haven’t managed to get their new lounge open in time for this. Im travelling through Gatwick In August Club (thanks to 2-4-1 voucher!) Will BA have a lounge by then in the new terminal? There should be a lounge by next week, allegedly …. Tried to update my profile with a forthcoming ski trip using the “add flights” option within mygatwick. It claims no such flight exists. Luckily I have a ticket which tells me it does and flightradar24 shows the flight details too! We use Planefinder to find out what’s happening to our flight before we set off. We’re based near Gatwick and can get there in under 10 mins. Which flight is that? I had similar last season & there was some odd work around I found.